Hurry up Mr. Postman! I am patiently waiting for my copy of Quiltmania to arrive. I ended up ordering my copy because after checking a few local Barnes & Noble stores I could not find the Special Spring Edition with Jen Kingwell's pattern in it. I have been hoarding a lot of fabrics from a membership to the Amitie block of the month. I am hoping to use them in this quilt. 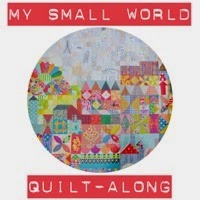 The Quilt Along starts May 18. I sure hope my magazine arrives before then. I think this will be really fun because so many of my IG and blog friends are joining in. I discovered the magazine at my LQS, but as I’m working on too many projects, I didn’t buy it. Yesterday, I went back to buy it after I had seen there will be a QAL! P.S. I hope your son is doing fine!!! I think I am going to do this QAL too. I got to see the actual quilt and meet Jen Kingwell yesterday and how can one resist it. Now I just need to get the magazine. Yes I am really looking forward to this too - the only thing I'm worried about seeing all the lovely blocks people have already posted to IG is that it seems that I am already behind and the QAL hasn't even started yet!